It’s 2019. New year, new you — as the expression goes. But what if you really need a fresh start? People leave an old job behind and embark on second careers for a host of reasons. Sometimes, the work is overly demanding or just plain stressful or too soul-crushing. Other times, the job is too rigid or inflexible (we’re looking at you, corporate America). Or maybe it’s the only way to flee the productivity-killing open-office floor plan. Other times, starting over isn’t by choice. For anyone who has been been laid off or fired, it’s a necessity to begin anew, often with lessons learned and a new wisdom that comes from experience. Whatever the case, anyone may draw inspiration from the above video of Laura Stachel, who needed to make a fresh start when a degenerative spinal condition forced her to give up her successful job as an OB-GYN. Today, she is the founder of We Care Solar, a social enterprise whose solar suitcases light up maternity wards in developing nations, saving pregnant women’s lives. Here’s how Stachel made the transition to a second career, for which she has been named a CNN Hero. There are plenty of takeaways for anyone looking to similarly start anew. 1. Take the time you need to recover. 2. Consider this an opportunity to pursue a long-held dream. She enrolled at University of California-Berkeley’s School of Public Health, specializing in maternal health care. “What that did was move my mindset from being about helping individuals in a clinic, to thinking about what are public health problems,” she says. She was shocked to learn that 500,000 women were dying every year from complications of pregnancy and childbirth — many of which were treatable — and joined a project studying hospitals in Nigeria. As a doctor, she was able to do “participant observation” in a Nigerian hospital and the conditions stunned her. She witnessed health workers doing their best to provide care in a pitch-black maternity ward. One night, as a pregnant women battled eclampsia in the dark, “I was in the corner of the room saying, why am I bearing witness? Why am I here right now?” Stachel recalls. She went home and, with the help of her husband, Hal Aronson, came up with the original idea for We Care Solar, a solar electric system to help the hospital workers. That night, a judge from the competition called Stachel and said: “I think you should’ve won the competition. How much money do you need?” Stachel immediately doubled the amount and within 3 weeks the judge found funding from Berkeley’s Blum Center for Developing Economies. 4. Ask others for advice. She asked for help wherever she could — and found it in other social entrepreneurs, academics, lawyers, business consultants and engineers. Friends even gathered in her backyard to help her assemble We Care Solar’s first “solar suitcase” — a portable unit with solar panels and a lithium battery to power critical lighting for deliveries. 5. Bring the same zeal (maybe even more) than you brought to your last profession. Stachel is the first one to admit she never expected to be a social entrepreneur working in the developing world or an advocate for solar energy. But after witnessing the conditions in Nigeria, she threw herself into her work. That is doubtlessly one of the reasons We Care Solar today has a $5 million annual budget and 12 employees. 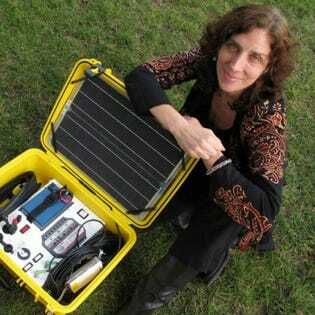 The organization’s solar suitcase has been used in more than 3,500 health centers around the world, saving countless lives of women and babies. When Stachel visits health centers to train workers on how to use the suitcases, she tells them: “Look, I’m a doctor. I knew nothing about solar. If I could learn this, you can too.” And if a doctor with a degenerative spinal condition can become a globe-travelling social entrepreneur, you can reinvent yourself, too. Read the entire We Care Solar startup story.